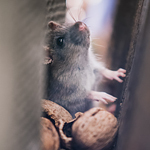 One of the easiest ways to reduce the number of rodents that are drawn to your vehicle to find shelter and electrical wiring to chew is to ensure that you're not luring them. Dog food or bird seed in the garage are both welcomed treats for rodents. After that, they might think of your engine as a warm place to make a nest. Bring any type of food inside. And if you want to make your engine a noxious environment for them, spray peppermint oil or detergent smells around the engine. They'll leave what's underneath the hood of your car alone after that.